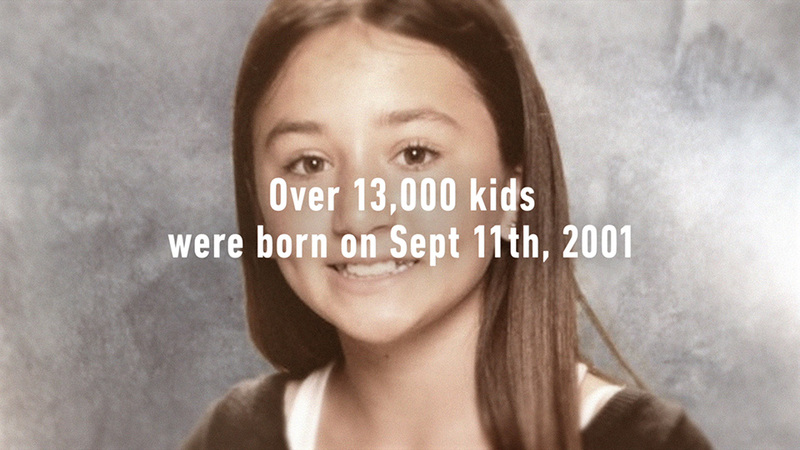 Transformation is the overriding theme of "Born On 9/11," Grey New York's integrated campaign for the nonprofit 9/11 Day organization—featuring PSAs that ask Americans to do at least one good deed next Friday to commemorate the 14th anniversary of the terrorist attacks on the World Trade Center and the Pentagon. In effect, we're challenged to transform our thinking, to erase sad, hateful thoughts and to use 9/11 as a springboard for putting hope into action. That may sound simplistic or trite, but the ads hit all the right notes. Various teens who share 9/11/01 as their birthday appear in the ads, and Hillary O'Neill makes a fine choice as the principal spokeskid. She seems so poised, genuine and self-aware that even the good-deed memory string tied around her finger—which, under other circumstances, might feel a bit forced—works well in context as a visual cue for the campaign. Plus, Bodega Studios director Adam Reid employs a relaxed, understated documentary style that keeps the proceedings from getting sappy. "When we interviewed these children born on 9/11, we quickly found out that none of them wished their birthdays were different," says Andreas Dahlqvist, Grey New York's chief creative officer. "In fact, they feel strongly that they represent what's good in the world." That vibe really resonates, and gives the campaign its quiet power. While watching the spots, it's possible to put cynicism aside and believe that simple good deeds—which users can share via the #911Day hashtag—might just add up and make the world a better place.